Two people come up when you google Greg Long. One is a Christian rock singer. 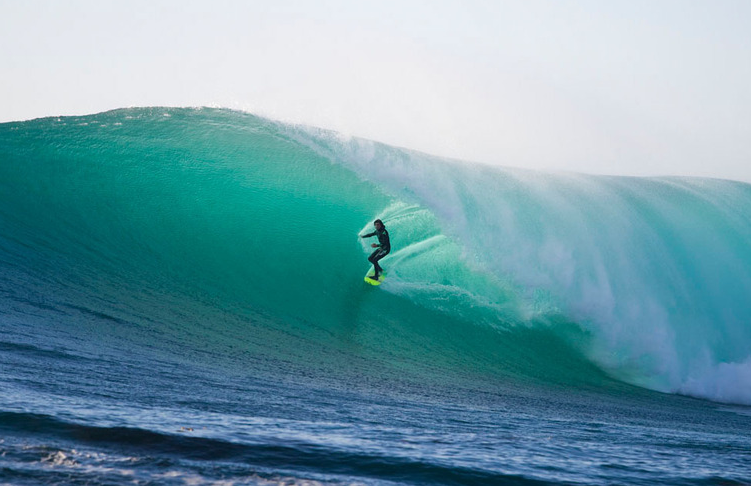 The other makes news headlines like "wins RIDE OF THE YEAR"or "attacked by TIGER SHARK", followed by images of giant waves with a tiny dot of a person riding on them. 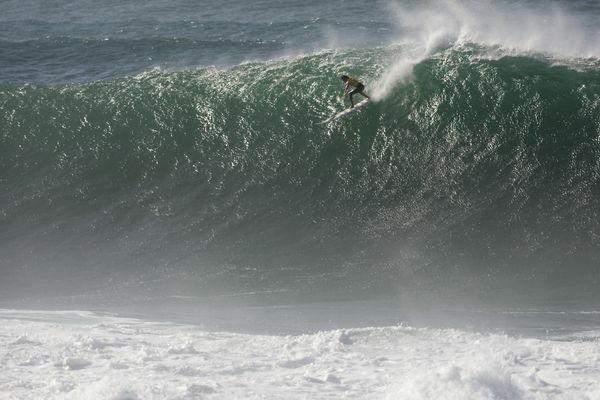 We got a chance to talk to the latter, one of the best big wave surfers ever and our SRF CTY host. Scott: Who taught you to surf? Greg: My Pops was a lifeguard for 34 years so I was introduced to the ocean before I could walk. Growing up I was involved in nearly every ocean activity possible. Swimming, bodysurfing, spearfishing, boogie boarding etc. I was 8 years old when I surfed for the first time. I was hooked after my first wave. S: What was your first surfboard? 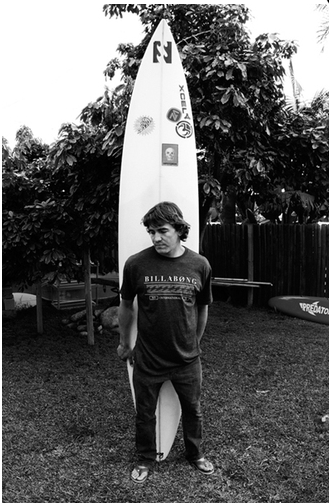 G: First surfboard was a 5'10 Spider Murphy single fin. Still have, and ride it today. S: What's your first big wave memory? G: My earliest recollection of big waves were from the old Bruce Brown films I watched as a kid. There was a larger-than-life cast of characters like Pat Curren, Jose Angel, Greg Noll and many more. There was something so profound and captivating about what those guys were doing, although, it wouldn't be for a number of years later that I think I would truly understand the feats they were performing. I started riding big waves when I was 15 years old when good friend Jon Walla took me down to Todos Santos for the first time. It has been the number one passion in my life ever since. S: Since a lot of your big wave surfing is done through travel, could you imagine ever living in NYC? G: New York is an amazing city. I unfortunately couldn't ever live there simply because I couldn't keep up with the fast pace of life. I grew up in a relatively quiet town and in all my travels have learned to appreciate a slower mellower lifestyle. NYC doesn't seem like a very conducive place to fostering such a thing. S: Is big wave surfing a good way to avoid the crowds? G: Yes. Whenever the waves get big, it always seems to eliminate a large portion of the crowd. There is a large amount of respect and camaraderie amongst the big wave surfing community and most of the people who are out on the big days have become some of my closest friends as a by-product of our similar passion. Greg Long at Waimea Bay during the Quiksilver In Memory of Eddie Aikau contest in 2009. Image from LA Times Blog. S: What's your favorite surfboard that Chris shaped for you? 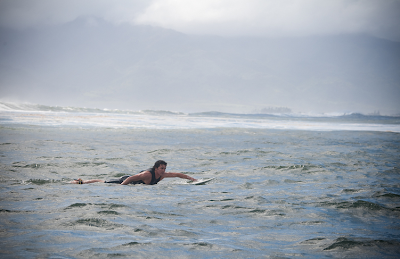 G: Definitely the board that I won "The Eddie" on. It was shaped specifically for Waimea. I only rode it twice. Once the day before the contest and again the day of the event. Winning the Eddie was a childhood dream of mine. There is a special sentiment behind everyone and everything that was a part of that day... especially that board. S: What's the most important lesson the ocean has taught you? G: I suppose a reoccurring lesson the ocean has taught me is the ability to adapt to my surroundings. In the ocean you are living in an ever-changing environment. No two waves are ever the same, tides come in and out, winds and currents are always shifting. This is almost an analogy for life in it's entirety. You have to be able to be able to adapt to whatever the world throws at you, and appreciate the miracles that are happening around you at every single moment regardless of the conditions. Read other exclusive interviews with SRF+CTY collaborators!